Before independence, Jamaica's economy was largely focused on agriculture with the vast majority of the labour force engaged in the production of sugar, bananas, and tobacco. According to one study, 18th century Jamaica had the highest wealth inequality in the world, as a very small, slave-owning elite was extremely wealthy while the rest of the population lived on the edge of subsistence. These products were mainly exported to the United Kingdom, Canada, and the United States of America. Jamaica's trade relationships expanded substantially from 1938 to 1946, with total imports almost doubling from ₤6,485,000 to ₤12,452,000. 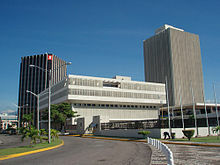 After 1962, the Jamaican government pushed for industrialization by trying to attract investments from foreign companies. Although the manufacturing and services sectors have grown in the second half of the 20th century, Jamaica's economy still faces some serious problems. The Jamaican economy suffered its fourth consecutive year of negative growth (0.4%) in 1999. All sectors excepting bauxite/alumina, energy, and tourism shrank in 1998 and 1999. In 2000, Jamaica experienced its first year of positive growth since 1995. Inflation fell from 25% in 1995 to single digits in 2000, reaching a multidecade low of 4.3% in 2004. Through periodic intervention in the market, the central bank also has prevented any abrupt drop in the exchange rate. The Jamaican dollar has been slipping, despite intervention, resulting in an average exchange rate of J$73.40 per US$1.00 and J136.2 per €1.00 (February 2011). In addition, inflation has been trending upward since 2004 and is projected to once again reach a double digit rate of 12-13% through the year 2008 due to a combination of unfavorable weather damaging crops and increasing agricultural imports and high energy prices. Over the last 30 years, real per capita GDP increased at an average of just one percent per year, making Jamaica one of the slowest growing developing countries in the world. To reverse this trajectory, the Government of Jamaica embarked on a comprehensive and ambitious program of reforms for which it has garnered national and international support: a four-year Extended Fund Facility (EFF) by the International Monetary Fund (IMF) providing a support package of US$932 million; World Bank Group and the Inter-American Development Bank (IDB) programs providing US$510 million each to facilitate the GoJ’s economic reform agenda to stabilize the economy, reduce debt and create the conditions for growth and resilience.. In addition, the International Finance Corporation (IFC) and Multilateral Investment Guarantee Agency (MIGA) will continue to support private sector development. The reform program is beginning to bear fruit: Institutional reforms and measures to improve the environment for the private sector have started to restore confidence in the Jamaican economy. Jamaica jumped 27 places to 58 among 189 economies worldwide in the 2015 Doing Business ranking, the country’s credit rating has improved and the Government has successfully raised more than US$2 billion in the international capital in the markets in 2014 and 2015.. Despite some revival, economic growth is still low: the Jamaican Government is forecasting real gross domestic product (GDP) growth of 1.9 per cent for the fiscal year 2015/2016 and the country continues to be confronted by serious social issues that predominantly affect youth, such as high levels of crime and violence and high unemployment. Jamaica, which had seen its poverty rate drop almost 20 percent over two decades, saw it increase by eight percent in a few years. The unemployment rate in Jamaica is about 13.2% (April 2015, Statistical Institute of Jamaica ), with youth unemployment more than twice the national rate (38%). However, among Jamaica’s assets are its skilled labor force and strong social and governance indicators. A proportional representation of Jamaica's exports. Agricultural production is an important contributor to Jamaica's economy. Agricultural production accounted for 7.4% of GDP in 1997, providing employment for nearly a quarter of the country. Jamaica's agriculture, together with forestry and fishing, accounted for about 6.6% of GDP in 1999. Sugar has been produced in Jamaica for centuries, it is the nation's dominant agricultural export. Sugar is produced in nearly every parish. The production of raw sugar in the year 2000 was estimated at 175,000 tons, a decrease from 290,000 tons in 1978. Jamaican agriculture has been less prominent in GDP in the 2000s than other industries, hitting an all-time low between 2004 and 2008. This may have been due to a reaction to increased competition as international trade policies were enacted. For example, as NAFTA was enacted in 1993, a significant amount of Caribbean exports to the United States diminished, being out competed by Latin American exports. Another example is the Banana Import Regime's 3rd phase, in which EU nations had first given priority in banana imports to previously colonized nations. Under pressure by the World Trade Organization, the EU policy was altered to provide a non-discriminatory trade agreement. Jamaica's banana industry was easily outpriced by American companies exporting Latin American goods. Jamaica's agriculture industry is now bouncing back, growing from being 6.6% of GDP to 7.2%. The recent growth of the agriculture industry may lead to further improvements in unemployment and exports. Sugar formed 7.1% of the exports in 1999 and Jamaica made up about 4.8% of the total production of sugar in the Caribbean. Sugar is also used for the production of by-products such as molasses, rum and some wallboard is made from bagasse. Banana production in 1999 was 130,000 tons. Bananas formed 2.4% of the exports in 1999 and Jamaica formed around 7.5% of the total production of banana in the Caribbean. Jamaica stopped exporting banana in 2008 after suffering from several years of hurricanes that devastated the plantations. Coffee is mainly grown around the Blue Mountains and in hilly areas. One type in particular, Jamaican Blue Mountain Coffee, is considered among the best in the world because at those heights in the Blue Mountains, the cooler climate causes the berries to take longer to ripen and the beans develop more of the substances which on roasting give coffee its flavor. Coffee formed 1.9% of exports in 1999. The picking season lasts from August to March. The coffee is exported from Kingston. Cocoa is grown throughout Jamaica and local sales absorb about 1/3 of the output to be made into instant drinks and confectionery. Citrus fruit is mainly grown in the central parts of Jamaica, particularly between the elevations of 1,000-2,500 feet. The picking season lasts from November to April. Two factories in Bog Walk produce fruit juices, canned fruit, essential oils and marmalade. Coconuts are grown on the northern and eastern coasts, which provide enough copra to supply factories to make butterine, margarine, lard, edible oil & laundry soap. Other export crops are pimento, ginger, tobacco, sisal and other fruit are exported. Rice is grown around swampy areas around the Black River & around Long Bay in Hanover and Westmoreland parishes for local consumption. As tastes have changed in Jamaica in favor of more meat and packaged food the national food import bill has grown to the point that it threatens the health of the economy. The government has responded by encouraging gardening and farming, a response which has had limited success. For example, the percentage of potatoes grown locally has increased, but imports of french fries have continued at a high level. Pastures form a good percentage of the land in Jamaica. Many properties specialize in cattle rearing. Livestock holdings were 400,000 head of cattle, 440,000 goats, 180,000 hogs & 30, rs of livestock are increasing, this isn't enough for local requirements for a growing population. Dairying has increased since the erection of a condensed milk factory at Bog Walk in 1940. Even so, the supply of dairy products is not enough for local requirements and there are large imports of powdered milk, butter and cheese. The fishing industry grew during the 1900s, primarily from the focus on inland fishing. Several thousand fishermen make a living from fishing. The shallow waters and cays off the south coast are richer than the northern waters. Other fishermen live on the Pedro Cays, 80 miles (130 km) to the south of Jamaica. The total catch in 2000 was 5,676 tons, a decrease from 11,458 tons in 1997; the catch was mainly marine, with freshwater carp, barbel, etc., crustaceans & molluscs. By the late 1890, only 185,000 hectares (460,000 acres) of Jamaica's original 1,000,000 hectares (2,500,000 acres) of forest remained. Roundwood production was 881,000 cu m (31.1 million cu ft) in 2000. About 68% of the timber cut in 2000 was used as fuel wood while 32% was used for industrial use. The forests that once covered Jamaica now exist only in mountainous areas. They only supply 20% of the island timber requirements. The remaining forest is protected from further exploitation. Other accessible mountain areas are being reforested, mainly with pines, mahoe and mahogany. Jamaica was the third-leading producer of bauxite and alumina in 1998, producing 12.6 million tons of bauxite, accounting for 10.4% of world production, and 3.46 million tons of alumina, accounting for 7.4% of world production. 8,540 million tons of bauxite was mined in 2012 and 10,200 million tons of bauxite in 2011. Mining and quarrying made up 4.1% of the nation's gross domestic product in 1999. Bauxite and alumina formed 55.2% of exports in 1999 and are the second-leading money earner after tourism. Jamaica has reserves of over 2 billion tonnes, which are expected to last 100 years. Bauxite is found in the central parishes of St. Elizabeth, Manchester, Clarendon, St. Catherine, St. Ann, and Trelawny. There are four alumina plants and six mines. Jamaica has deposits of several million tons of gypsum on the southern slopes of the Blue Mountains. Jamaica produced 330,441 tons of gypsum in the year 2000, some of which was used in the local cement industry and in the manufacturing of building materials. Other minerals present in Jamaica include marble, limestone, and silica, as well as ores of copper, lead, zinc, manganese and iron. Some of these are worked in small quantities. Petroleum has been sought, but so far none has been found. The manufacturing sector is an essential contributor to the Jamaican economy. Though manufacturing accounted for 13.9% of GDP in 1999. Jamaican companies contribute many manufactures such as food processing; oil refining; produced chemicals, construction materials, plastic goods, paints, pharmaceuticals, cartons, leather goods and cigars & assembled electronics, textiles and apparel. The garment industry is a major job employer for thousands of hundreds of locals and they formed 12.9% of exports in 1999 earning US$159 million. Chemicals formed 3.3% of the exports in 1999 earning US$40 million. An oil refinery is located near Kingston converts crude petroleum obtained from Venezuela into gasoline and other products. These are mainly for local use. The construction industry is growing due to new hotels and attractions being built for tourism. Construction and installation formed 10.4% of the GDP in 1999. Manufactured goods were imported and formed 30.3% of the imports and cost US$877 million in 1999. Since the launch of the Jamaican Logistics Hub initiative, various economic zones have been proposed throughout the country to assemble goods from other parts of the world for distribution to the Americas. Some destinations include Ocho Rios, Green Grotto Caves, Y.S. Falls and Appleton Estate. Most of the tourist sites are landmarks as well as homes for many Jamaicans. Many of the most frequented tourist sites are located mainly by water such as rivers and beaches where fishermen make a living from seafood. One of the most famous beach towns in Jamaica is Ocho Rios, a located in the parish of Saint Ann on the north coast of Jamaica. It was once a fishing village but now attracts millions of tourists yearly. The site is popular today because of the food and culture that can be found there. Another famous location in Jamaica that attracts millions yearly is Dunn's River Falls, located in Ocho Rios; this waterfall is approximately 600 feet long and runs off into the sea. Around the location many hotels and restaurants are available and many street vendors sell food around the clock. Another well-known beach town is Negril, the party capital of the country. This beach town has many different factors to add to the night life. Rising to join Singapore, Dubai and Rotterdam as the fourth node in global logistics, the Jamaican Government has embarked on a restructuring of the economy, deciding to utilise its location at the centre of North-South and East-West shipping lanes to become the choice of global logistics companies to be the Hub of the Western Hemisphere, serving a market of 800 million, and becoming the gateway to Europe and Africa. With the establishment of the Logistics Hub, Jamaica is set to become an important part of the global value chain. Preliminary agreements with the Chinese government were signed in April 2014, marking the first step in the restructuring of the Jamaican economy. Separate Tax Rates apply for foreign nationals. ^ "World Bank forecast for Jamaica, June 2018 (p. 152)" (PDF). World Bank. Retrieved 11 September 2018. ^ "Jamaica GDP - composition by sector". IndexMundi. Retrieved 27 March 2018. ^ "Jamaica". Retrieved 11 June 2015. ^ "Employment & Earning". statinja.gov.jm. Retrieved 19 November 2018. ^ "The Labour Force in January 2018" (PDF). Statistical Institute of Jamaica. Retrieved 21 June 2018. ^ "Salary Survey in Jamaica". Retrieved 11 June 2015. ^ "Ease of Doing Business in Jamaica". Doingbusiness.org. Retrieved 24 November 2017. ^ a b "Embassy of Jamaica, Washington, DC". Retrieved 11 June 2015. ^ a b "Jamaica (04/01)". Archived from the original on 4 October 2015. Retrieved 11 June 2015. ^ a b c "Jamaica signs deal for China-built cargo shipping hub". Reuters. April 2014. Retrieved 11 June 2015. ^ a b "Proposed Caymanas Economic Zone To Be One Of 16 - Jamaica Information Service". Jamaica Information Service. 2014-01-13. Retrieved 11 June 2015. ^ a b c Central Bureau of Statistics Jamaica B.W.I. (1947). Quarterly Digest of Statistics No. 2. Duke Street, Kingston: The Government Printer. ^ Burnard, Trevor; Panza, Laura; Williamson, Jeffrey G. (October 2017). "The Social Implications of Sugar: Living Costs, Real Incomes and Inequality in Jamaica c1774". NBER Working Paper No. 23897. doi:10.3386/w23897. ^ Burnard, Trevor; Panza, Laura; Williamson, Jeffrey (2017-12-06). "Sugar and slaves: Wealth, poverty, and inequality in colonial Jamaica". VoxEU.org. Retrieved 2017-12-06. ^ "Historical Currency Converter - OANDA". www.oanda.com. ^ a b "Jamaica Agriculture, Information about Agriculture in Jamaica". Retrieved 11 June 2015. ^ "Agriculture - Jamaica - import, export, crops". Retrieved 11 June 2015. ^ "Jamaica GDP from Agriculture". Trading Economics. TRADING ECONOMICS. Retrieved 29 November 2017. ^ "Caribbean Basin Struggles in NAFTA's Shadow". International Centre for Trade and Sustainable Development. International Centre for Trade and Sustainable Development Organization. Retrieved 30 November 2017. ^ "The EU Banana Regime: Evolution And Implications of its Recent Changes" (PDF). European Parliament. Retrieved 30 November 2017. ^ "CENTRAL AMERICA AND CARIBBEAN :: JAMAICA". The World Factbook. Central Intelligence Agency. Retrieved 30 November 2017. ^ Damien Cave (3 August 2013). "As Cost of Importing Food Soars, Jamaica Turns to the Earth". The New York Times. Retrieved 4 August 2013. ^ "BAUXITE AND ALUMINA" (PDF). minerals.usgs.gov. January 2012. Retrieved 19 November 2018. ^ "Mining - Jamaica - export, sector". Retrieved 11 June 2015. ^ a b "jamaicalogisticshub.com". jamaicalogisticshub.com. ^ "GTTP: The Global Travel and Tourism Partnership". Archived from the original on 24 July 2008. Retrieved 11 June 2015. ^ a b "Tax Administration". Archived from the original on 13 April 2014. Retrieved 12 April 2014. Bahl, R., & Wallace, S. (2007). From income tax to consumption tax? The case of Jamaica. FinanzArchiv/Public Finance Analysis, 396-414.